Monroe takes a look at the mirror that Eve saw the creature in. Adalind thinks that the thing may be after Eve since no one else has seen it. Nick saw it too, and in a dream. Diana tells them that it wasn't a dream, its not real yet. Its something that will happen in the hole in the mirror she tells them. Monroe insists on a buddy system. Two hunters find a lone doe, and think she's easy prey. They take a shot at the deer, and the shooter thinks he got her. Ralph goes for back for beer, trailing behind, but when the hunter finds his doe, something slithers through the grass. Tree roots grab him by the ankles, and pierce through the middle before dragging him away in front of Ralph. Ralph sees the treeman, and tries to make a run for it, but he plows his truck into another tree. Nick gets his buddy Adalind before he goes in for a shave. Adalind and Nick both have their worries about the mirror. 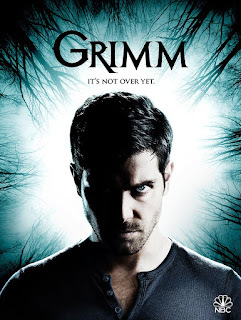 Adalind worries that the thing isn't afraid of Grimms, and decides that she likes him with stubble. He happily skips the shave. Wu calls with the latest crime scene. Nick and Hank arrive to the hunter's truck. Ralph isn't the sedate witness. Nick and Hank calm him for a second as he rambles on about a monster killing his friend. He's relieved to hear that someone believes him, and he's more than happy to show them where he last saw his friend. Hunting at night may be a no-no, but that's not the issue. He recalls the spine piercing his friends chest, and watching him die, how the plant man picked up his friend, and him running afterwards. Hank isn't sure if he's telling the truth, or if he killed his friend, but they plan to investigate. Eve heads to the Spice Shoppe. She wants to see the mirror. Rosalee is sure that the mirror isn't magic, it was her mother's. Monroe doesn't trust the mirror. Eve takes it in hand anyways, she smashed it shes sure, and yet its whole, even though its covered in a blood red. Turning the mirror over, it drips blood, and Monroe has had enough. He takes the mirror. Eve knows there is only one way to figure out whats with this other mirror world, to go there. Nick looks into the hunting friends' records. Hank finds that each hunter fired one bullet. Nick wonders if Dev was wesen, and warged, scaring him. Wu tells the pair that the woods have a history of missing people, usually hikers. Nick and Hank head back into the interrogation room to press Ralph. Ralph sticks to his crazy story, no matter how much Nick and Hank lean on him. They found not just blood on Ralph, but lots of Chlorofil. Captain Renard gets some help with Diana's drawing. Some of the symbols are ancient, some are unknown. The woman wonders why the child would draw such things. She suggests that Renard find out where the drawings come from, since she doesn't think that they're made up. Nick and Hank pick at Monroe and Rosalee's brain about possible wesen. They suspect a forest wesen who don't take kindly to people messing with their territory. Hank finds the Kinoshimobe matches the description, a Japanese tree wesen. Its possible that the thing never wargs, and doesn't have a human form. Nick gets a call, and goes to check out a new lead. A woman with G & K Waste Solutions unloads in the woods. Lots of red goo. Wu shows that all of the victims were poachers or worst. Ralph didn't shoot the deer, hence why he was spared. Nick and Hank make plans to go back in the morning. Kinoshimobe strikes again, taking out the Waste Solutions dumper. Roots reach out for the body as the thing makes an offering to the trees, and then the body is gone. Nick, Hank and Wu head into the woods. Even if they find the Kinoshimobe, they don't know what to do with it. They spread out to look for it. Nick comes face to face with a dark tree in the middle of the woods. Wu finds the waste truck, and an oozy mess. It looks like toxic waste that was being dumped, and a bloody chair left behind. Everyone heads into the new crime scene. The dumper, Patricia, has had quite a few run-ins with the law about dumping, but never more than a slap on the wrist. Nick, Hank and Wu begin to map out where the Kinoshimobe is likely holed up. Back into the woods they head, and Nick goes straight back to the dark tree that gave him a weird feeling. Wu is concerned about the weird vibe, as Nick's weird feelings aren't normal. It's damp all around the tree, as in bloody damp. Hank finds a face in the tree, Nick finds one as well. There are several faces, like a lot in the tree. Rosalee recognizes the type of tree it is. It's not wesen at all. Its a Chuboco, and it survives on human blood. They reason that the Kinoshimobe is working with the Chuboco. Rosalee thinks that they may need to pretend to cause harm to the environment to get the Kinoshimobe's attention. Rosalee thinks she has something safe that will get its attention. While she cooks up her brew, Nick and the menfolk gear up. Monroe and the others go to the Chuboco. He tries to add logic about why there might be faces in it, other than the whole absorption theory, but after a moment the creep factor gets to him. The tree really eats people. They four pour their gunk around the tree, and nothing comes out. The Kinoshimobe is a no show. Nick wants a more toxic brew, but Monroe is worried. Rosalee has an idea, and she heads towards them. Monroe questions them taking out something that is just protecting its home. Rosalee is close, when something punctures her car, causing it to leak. She should be there, and when she doesn't arrive Monroe calls her. She sees that her car is leaking oil, and she's not the only one that sees the oil. The Kinoshimobe closes in. Monroe runs towards Rosalee's calls, with Nick, Hank and Wu close behind. They find Rosalee unharmed and take her back to their car, which is parked near the Chubuco. As she takes in its strange beauty, the Chubuco tries to take Rosalee. They manage to cut her free as the Kinoshimobe arrives. Nick tries to talk to it, but he's not much of the talking type. The Chubuco grabs at everyone, except Nick. Nick kills the Kinoshimobe, and the Chubuco takes the Kinoshimobe inside of it. They call it a day, but the Kinoshimobe may not be completely dead, as it opens it eye as they leave. Nick adds his account to the Grimm book. Monroe nixes anymore adventures while Rosalee is pregnant. As they lay in bed, they can't help but notice “faces” in their ceiling. Maybe a paint job is in order.